At Jesus' words, "Young man, I tell you to arise! ", the astonished people saw the lifeless body of the boy rise to a sitting position. N THE CITY of Nain, in Galilee, lived a woman who was a widow. She had only one child, a youth entering manhood. No doubt she often looked proudly at him and thought the time would soon come when he could provide for her needs as well as for his own. Then one day the young man fell sick. This was a sad time for the widow, and day after day she watched at the bedside of her son, hoping to see a change for the better. Tenderly she nursed him; but in spite of all her loving care he only grew worse. Then one day he died. Now the widow's home was broken up; for both her husband and her son were dead. How unhappy she felt! Her neighbors and friends came in to weep with her and to plan for the funeral. They wrapped long strips of linen cloth around the lifeless body and placed it on a frame, called a bier. Then they took up the bier and started with it to the burial-place outside the city gate. Many people followed the bier, and the mourners wept aloud as the procession moved slowly toward the burial-place. Outside the gate they suddenly stopped. Everybody wondered what had happened. Then they saw a great crowd coming toward them, and walking in front of the crowd was Jesus and his twelve disciples. 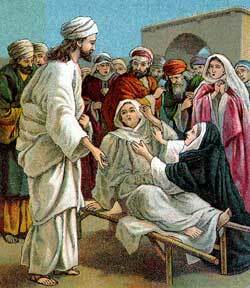 When Jesus saw the grief of the widow he was touched with pity for her. He knew how deep was her sorrow, and he wished to help, so he spoke kindly to her and said, "Do not weep." Then he stepped up to the bier, and the men who carried it looked at him. They were astonished when they heard him speak to the lifeless form that was lying so cold and helpless upon the frame. But at Jesus' words, "Young man, I tell you to arise!" they saw the lifeless body rise to a sitting position, and they heard the voice which death had stilled speak to them again. What a glad surprise this was! Quickly they unwrapped the long strips of linen cloth from the young man's body, and Jesus took him to his mother. Now the cries of mourning cease and a great silence fell over the people. They could hardly believe their own eyes. But soon they were convinced that Jesus had raised the dead young man to life again, and they began to rejoice. "A great prophet is come among us!" they exclaimed with delight. Others cried, "Surely God has visited his people!" for they believed that only the power of God could overcome death, and they believed God had come to them in the form of the man Jesus. News of this great miracle quickly spread through the country and traveled far and wide. Even John the Baptist, shut up in the dreary prison where Herod had placed him, heard what Jesus had done. He longed to see and to know more about these things, so he asked two of his disciples who visited him at the prison if they would not go to Jesus and find out whether Jesus was really the Savior whom God had promised to send. The men hurried to Jesus with John's question, and while they waited for an answer many afflicted people crowded close to the place where they stood and begged for healing. There were cripples, and blind folk, and lepers, and deaf people, and even some in whose bodies evil spirits were dwelling. One by one Jesus healed them, and cast out the evil spirits and sent them away. Then he turned to the inquirers who had come from John's lonely prison and said, "Go back, and tell John what you have seen; how the blind see, the lame walk, the deaf hear, the lepers are cured, the dead are raised to life, the evil spirits are cast out, and to the poor people the glad news of the kingdom is preached." The men took this message back to John, and no doubt his heart was glad to hear about the wonderful workings of Jesus. Not long after this time Herod commanded that John should be killed, and his friends who came often to comfort him in the lonely prison took up his body and buried it. Then they came and told Jesus what Herod had done.